I know you’re eager to know. One minute, please. My friend Sulekh, new author. I believe the best known Jain in America, all because so passionate about Jainism. Time and again my dear friend Sulekh Jain has astonished me. For 41 years! What’s it all about? Ahimsa is a remarkable philosophy, a unique way of life. You’ll be fascinated. Maybe puzzled, too. Sulekh gets all fired up extolling Ahimsa. He wants the whole world to practice Ahimsa. Its adherents are mostly Jains like himself. What’s interesting is that In India and the whole world there are only some eight million Jains. Very few. More than 90 percent of them live in India. They’re a tiny minority there but incredibly successful and influential. That’s a fact. Sulekh is a Jain. That’s why he carries that name. Not all Jains carry it. Sulekh is an American, by the way. Came here 47 years ago. Part of the huge brain drain from India—doctors and engineers and such. And he’s not a preacher. Not a book writer. He’s a Ph.D. mechanical engineer. Nine patents and more than 50 technical papers to his credit. Which has zilch to do with Ahimsa. Retired now but working full blast to promote Ahimsa. Sulekh gives a thousand reasons to back up why everybody should take up Ahimsa. So that includes me and you. Not his Jainism, but its way of life. Ahimsa is its core belief. And he weeps and worries about fellow Jains who don’t practice it fully. Which means they are not Jains heart and soul. That scandalizes him. And he blows the whistle when he catches them erring. Loud. Relentlessly. Do not jump to the conclusion that Jainism is a nutty, irrational religion like Scientology, say. Anything but. Let me be up front. I am not a Jain, though I’m impressed by Jainism. And greatly impressed by Ahimsa. But one problem. It’s so hard to practice! So what is it? Well, Ahimsa is a Sanskrit word. It’s a belief of Buddhists, Hindus, and Jains. It seems Jains are the most fervent about it—it’s the soul of their religion. The word Himsa—without the “a”– denotes a violent, cruel, evil act. Ahimsa is just the opposite. It means, living without violence, to be practiced all day long in thought and deed every day of your life. It’s a loving, considerate, peaceful way of living, totally free of violence toward not only people, but to any creature, from ants to elephants and ANY living thing, even plants. Yes, plants. Hard to believe, I know. So of course to you and me and all mankind. Regardless of creed, political belief, color, employment, or country. A tall order! It’s centuries old but the word for it is just beginning to appear in our dictionaries. I couldn’t find it in my print Merriam-Wester but I did in its online version. On a hunch, I also Googled it. And Google has a definition and it’s quite good. Whoopee! That’s progress. For Sulekh it’s a wonderful breakthrough. I’ve been hearing about Ahimsa ever since Sulekh and I became friends. But what I knew about it was like what I know about Australia or Mozart or Greek—darn little. I did know that in India the great Mahatma Gandhi practiced non-violence and got the idea from Jainism. He was not a Jain though he looked and lived like one. He used Ahimsa as his winning strategy in the long and hard campaign to wrest India from British control and set it up as the independent country that it is. I also knew that Martin Luther King read about Gandhi and Ahimsa while studying theology at Boston University. He preached and lived non-violence from start to finish. “We shall overcome!” he promised. And succeeded, just as Gandhi did. So, much of our racial and social progress derives directly from Jainism. Fascinating, don’t you think? I mentioned non-violence even to ants. Well, I got Sulekh’s 328-page book and was working through it just as I was facing an army of ants each time I prepared a meal. They scampered across my counter, through my sink, around my toaster, on my stove, all over the place. What to do? I squished them. Sometimes 20 or 30 in a minute. I felt awful. But what was I do? Let them take over? I felt every squish was also a squish against my conscience. Of course I kept thinking of Sulekh as I squished. What would you do? Sulekh conducts his total life a la Ahimsa. I’d be embarrassed to tell him what I was doing. Nothing would please him more than you’re taking up Ahimsa. Not formally becoming Jains. No. No. Not necessary. Just practicing its non-violence in every phase of your life. At home. At work. In society. Despite living in a world rife with violence big and small. Tap it and take a look. At the very least you’ll find his book is a terrific read. Sulekh’s book sounds like dull egghead reading. Not so. Sure, he covers the principles. But the practical examples and real-world situations that he brings up on page after page make terrific reading. You’ll be fascinated. Astonished. You may find some of the tenets and practices crazy….disturbing….because so strange and “unnatural” to you. It wouldn’t surprise me if you concluded Sulekh is an extremist. By now you know Sulekh grew up in India. So did his wife Sulekh. Their two children were born there. After university there, they moved to Britain and he got his Ph.D. there. All made possible by a competitive grant from the Indian government. Then pursuing a dream, he made it here to the U.S. with his family. They have been citizens for years. Sulekh worked for huge corporations—retiring from General Electric Aircraft Engines in Cincinnati nearly 20 years ago. They came as part of the “brain drain” in India—thousands of professionals who came here for a better life. At the time we met, there were some 40,000 Jains in the U.S. and Canada, all in large cities. And Sulekh, as young as he was (they were all young, I’m sure) had become president of the Jains of North America. There are perhaps 150,000 here and in Canada now. And all these years, Sulekh has played an important intrinsic leadership role among them. It goes on. I’m convinced he is the best known Jain in all of North America. Want to know more about him? 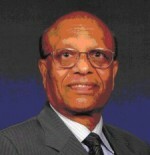 Google him… Dr. Sulekh C. Jain. You’ll find plenty. How do I know him? Hard to believe, through a botched real estate deal in the late 1970’s. I had read a book, “How to Make a Million Dollars in Your Spare Time.” Or something like that. This is when I was running my own PR office in Worcester. I was plenty busy, but I could scrape up some spare time, and I liked the idea of making a million. The book said to buy a nice six-unit apartment house. That would be a good way to ease into the business. There was a new law in Massachusetts. Every commercial property being sold had to be tested for lead paint. Lead paint can be poisonous, especially to little kids. That law was a surprise to him. Sulekh didn’t think his place had lead paint. He called in an inspector. His six-unit failed the test. He refunded my money. I went on and found another and bought it. Then bought others. But that’s another story. Back then, twice a week, after my day’s work, I’d swim laps at the Y. Often afterward I’d go across the street to the Worcester Public Library, library lover that I am. This time I spotted Sulekh reading something. He did not spot me. I wondered, Should I? Shouldn’t I? I went over and said hello. He jumped up, shook my hand. Asked me, “What have you been doing?” I told him how I swam laps. “Sulekh, if you can walk, you can swim.” It was small talk. We broke up. He was a quick learner. We met and met. It soon became personal. He talked about his growing up….being a Jain…an Indian. He told me and his wife Ravi had a marriage arranged by their fathers. I had never heard of that. I, he said, probably met my spouse Pauline through my own initiative and hers. All true. He called it a romantic marriage. For sure. “But the divorce rate is so huge,” he told me. Well, yes, many Americans do divorce. Some more than once. Maybe sometimes that’s a good idea. We became friends. We’d take walks and talk. He came to Worcester to be senior research engineer at big Wyman-Gordon Co. A big job. But even with that plus his family responsibilities he found time to earn an MBA evenings at Clark University. We visited in one another’s homes. His two kids were the ages of my older two. We took Sulekh and Ravi sightseeing. I introduced him to canoeing. When he left his job in Worcester for an even bigger one in another state, our friendship continued. When his son Anudip married in Cincinnati—a three-day ceremony, by the way—Pauline and I were there. More than once he said, “John, someday I will take you to India!” A wonderful offer. But so incredible that I’d just say thank you and laugh. Impossible. No way could I go for seven weeks! By the way, Pauline and I had split up. He found that hard to accept. He liked her. But he accepted it. My daughter, Monique, convinced me. “Dad, it’s a once in a lifetime opportunity!” I told Sulekh to count me in. And I adjusted things as best I could in my business. Monique was right. It was the trip of a lifetime. We crisscrossed India. Big cities, smaller cities. Sulekh, his wife Ravi, and your truly, with a hired driver. He was touring as the president of the Jains of North America. Everywhere he’d give talks to assemblies of Jains…would be greeted like a cardinal, so to speak. He’d tell them what America is like….how Jains remain close to the mother land. And would advance pressing projects—how to raise money for a chair in Jainism at Harvard University, how to make it easier for parents in the U.S. and India to arrange marriages for their kids. Often we’d live as guests in the homes of wealthy Jains. I was always the sensation, of course….the white man from the U.S.A. I tried to be a good ambassador. And oh! They were all vegetarians. I was not. But I had to eat vegetarian that whole seven weeks. We met important people. The publisher of the big important Times of India, who was a Jain. A member of the Indian Supreme Court, who was a Jain. Big businessmen. We visited all kinds of famous monuments and numerous ancient, exquisite Jain temples. Saw everyday life close-up—“sacred” cows walking loose in the streets, elephants lumbering down a big boulevard right in Delhi, the capital, and the Taj Mahal, of course. On and on. I saw little women in saris doing hard pick and shovel work and hand-mixing mortar for masons, the widespread poverty, the hordes of people everywhere, the real India. Yes, it was the trip of a lifetime. I wrote articles about that. In fact, some for Jain papers and magazines in the United States. Our friendship has continued all these years. All this time he has continued his leadership role among the Jains. Has started remarkable programs, including a big one that sends American academics and graduate students to India on subsidized trips. The idea is for them to learn more about Jainism, even living with Jains in their homes over there. Some of his “alumni” now teach and write about Jainism. He is proud that 17 American universities now offer courses in Jainism. He was the kingpin in making that happen. He’s lining up more. “Yes, that’s true.” He thought a minute. “But this is the only passion I have left!” Big laugh! Do look through his book. Savor it…jump around in it…pause and read this and then that. I guarantee you will get a lot out of it, great entertainment at the very least. May be startled. May shake your head in disbelief. But may also be greatly and favorably impressed. To give you a better idea, here’s a look at Sulekh’s Jain /Ahimsa lifestyle. He does not wear leather shoes, belts, wallets, anything, because animals have to be killed to provide leather. He grew up vegetarian…no meat, fish, foul. Does not eat honey because that’s the bees’ food. Will not wear silk, because silk worms will die in the process. No eggs—eggs are future chickens. Won’t eat certain root plants, carrots and beets and such, because that kills the plant. Then 30 years ago he became vegan. He used to eat milk, cheese, ice cream. Ravi used to make yogurt just about every day. Delicious. One day she showed me how. Now milk in its many ways is now completely out. Cow’s milk is intended for their calves, not us. By the way, his son and daughter are both MD’s. Anudip is a radiologist. Anudip’s wife Aarthi, also Indian, is an M.D. His daughter Vandana is an oncologist. As I told you, Ahimsa ain’t easy. This is why many Jains, here and in India, often mess up. Not only by eating taboo foods. But by doing bad things in business in order to make money. Cheating! Profiteering! Sulekh gives example after example, especially about what’s going on in India every day. Incredible. Scandalous. Do make sure to read those chapters. He is outspoken about this. Criticizes Jains who succumb to this. Exhorts them to do better. Blows the whistle! Loud! Sulekh showed his book around before its publication, to his family, friends, a number of people. His daughter Vandana warned him. “Papa, please do not publish this. Many people will take offense.” And by offense, she had in mind fellow Jains. And she was right. Some are. Sulekh told me he slept on that….delayed publication by a year. I am not a Jain. Yes, I am a vegetarian and in good part because of his example. Truth is I got the thought as a boy after I came upon my grandfather LaPlante slaughtering a big hog that I liked to visit in the barnyard when we went up to his farm. I saw how that innocent hog was squealing and squealing in dire agony. In time I found out vegetarianism is acclaimed as a better diet from every point of view. And to repeat, I am not a Jain, although I do believe in non-violence as a principled way of life. And I practice that. But I am a human being. So, I’m imperfect. That’s how I explain my squishing those ants. In fact, the next time I speak with Sulekh, I will tell him about that. Ask him how he’d handle that infestation. It turns out even some of his family members aren’t going along with him on everything. Recall his daughter’s cautioning him? Ravi, his wife, a lovely lady, dresses fashionably in beautiful saris, often of silk, in the Indian way. “Does she still wear silk?” I asked him. He might have fibbed. He might have been tempted to fib. Was honest. That’s the Ahimsa way. It made me feel good about him. As always. I do admit that I’ve gotten to see that those tiny ants are truly amazing … I’ve studied them and admire them. They’re doing their best to live their lives as best they can. Just as I am. Still! Well, take a look at Sulekh’s book. Judge for yourself. You decide! As he suggests. As usual I welcome your honest feedback. If you feel Ahimsa is great. Or plain wacky.